Deaconess Elizabeth Froh provides consistency and a big heart to high school students who visit The Hangout at Grace Lutheran Church on Ridge Road. This year marks the 10th anniversary of the program that provides a safe place after school with free food, games and a family style atmosphere. A decade ago when retired teachers and members of Grace Lutheran Church saw high school students roaming the streets with nowhere to go after school they felt compelled to do something. So the church opened its doors, offering food and games and a safe place to go. Since opening, The Hangout, located at 1979 Ridge Rd., Grass Valley, near Nevada Union High School has served over 35,000 student visits and made a difference in many people’s lives. It’s a winning combination of grandparent-style volunteerism and the big heart and steady consistency of Deaconess Elizabeth Froh, an adult who gets it. “Forming that relationship is key. We’ve had great groups of kids in here,” said Froh, a woman in her 30s, who has worked as a nanny and P.E. teacher but never married or had any kids of her own. She thinks young people connect with her because she remembers what it was like to be their age. It wasn’t long ago that she was an awkward teen acting tough in front of Starbucks or as a 20-something working in the pool hall. She has endured her own personal struggles with bipolar disorder. “Sometimes the scars can make things prettier. It’s just being honest with who you are,” said Froh, who just finished her second year as the first official director for the program. She keeps up with issues facing young people — from grief to suicide — and isn’t afraid to ask if it appears a young person is troubled. She lets them know she is here for them. She has earned respect from all walks of life and sees teens with autism, teens on the honor roll, homeless teens and teens from broken homes. “They just know they’re welcome. They all know they’re safe and wanted. Liz makes it so accessible and listens to them,” said Mary Bacigalupi who has been coming with her husband, John, the church organist, since the program began. “I have my rules and the kids know,” Froh said. Froh opens up her office where an entire library awaits those who have earned her trust and want to borrow a book or need a quiet place to sit and read. When school lets out, students arrive, usually hungry. Two food banks, Interfaith Food Ministry and Nevada County Food Bank, donate food for the program that is free to high school students. “Some of these kids don’t eat all day,” said Froh who keeps healthy, nourishing snacks with fresh fruit and veggies and warm meals in winter top of mind. She is also known for her “Hangout Trifle” — an impressive concoction of all things sugar — whatever remnant frosting, pudding, cookies and candy are at her disposal. Last school year, 182 students signed up for the program, for a total of 4,000 student visits, averaging 25-35 teens a day. Upwards of 10 volunteers from the church keep the program running smoothly and a tutor comes in twice a week. Sometimes, alumni of the program, now students at Sierra College, return and help out. It’s a place for them to get grounded as they go through the transition of young adulthood. Barb and Mike Kish bring their dog, “Sadie,” a poodle and trained therapy dog that has become the house mascot. Mike Kish enjoys playing pool with the younger generation and being there to listen when kids need a father figure to open up to. “I think kids get a kick out of it because we’re from a different era,” said Mike Kish. Face to face communication and relationships are being formed between two vastly different generations. Miraculously, young people are putting their phones down. It’s a busy place in the afternoon with pool and foosball tournaments, board games, table tennis, art projects, a PS3 game system and an old Wii in the corner, and lots and lots of talking. “It’s like ‘The Breakfast Club’ on steroids,” said Froh. 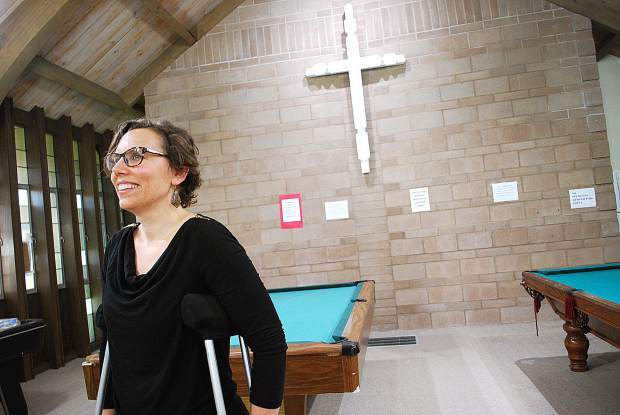 Recognizing community needs and their role serving local families, members of Grace Lutheran Church are launching a fundraising campaign to restore the community center that houses The Hangout. Built in 1966, the building is over 50 years old and falling apart. Since March, church members have raised $300,000 and have pre-qualified for a bank loan of $400,000. An additional $400,000 is needed from the community to modernize the facility, double the size and productivity of the kitchen and provide wheelchair accessible bathrooms. The new kitchen will allow the church to provide dinners for working families, many who commute, in need of a break after a long workday. “We’re not just taking care of kids. We’re taking care of families,” said Froh. This year marks the 115th anniversary for the church that was founded in Chicago Park with the St. Paul congregation in 1902. “We wanted to serve the community. We’re loved. How could we not love others?” said Barb Kish. Contact freelance writer Laura Petersen at laurapetersenmedia@gmail.com or 530-913-3067.